Life as I know it -- which is pretty boring most of the time -- began to fall apart with the 24-hour power outage in late June. Then came the news that our planned vacation, The Greenbrier Golf Classic, was cancelled due to the flooding in White Sulphur Springs, WV. In this two-month period we've had to replace a TV, DVD player, microwave, and HVAC, unrelated to the power outage (at least that's what I think), as well as Alex's glasses. My Faithful Pfaff had to go to the hospital this week after a needle got jammed in the bobbin area. I mention all this to explain why I didn't meet my One Monthly Goal (OMG) for July. Even though I had time, it's hard to concentrate with all those distractions. I did put Terrific Triangles up on the design wall, even bought some fabric for setting triangles, but I'm still dithering about how to finish it since I'm not happy with the size and I have fabric available to add more triangles. Bloom Where Planted never made it out of the box to be quilted. Both of these projects will go to retreat with me later next month. The positives: Alex and I cobbled together a most enjoyable alternative vacation trip (still no refund on the tournament tickets, though). Alex's test results were negative and the professionals convinced him he has serious sleep apnea (something I've been telling him for years) so that study still needs to be scheduled. After a battery of tests it was determined that SIL's condition can be improved with an occasional Xanax. My first survey of the stash did not reveal an appropriate border fabric so I think I'll call it done and bind with a purple to create a finishing frame. Both of these little numbers will go into my donation queue. So that's it for July. Hop over to Red Letter Quilts to see how others managed their OMGs. The color was hot pink, or maybe watermelon pink, or maybe just pink -- with green accents. The scraps were few -- mostly 1-1/2" strips and 2-1/2" strips. I tried to use all the scraps I had and pieces that I had cut. as did the unused black quarter-square triangles. Thanks to Angela at soscrappy for hosting Rainbow Scrap Challenge 2016. Working with all this watermelon pink made me hungry for the sweet stuff. ... I initially planned to use the black fabric around the 16-patch centers to create an on-point contrasting square, but I didn't think there was enough value contrast with the centers. So I opted to use the tiny star background instead. But I had already cut a bunch of the black quarter-square triangles. ... 6 or 7 of them will go into each border. But I didn't have enough of the little star fabric so I picked a dot in the same tones of pink for the border. What do you think? Does it work? Should I make the placement of the geese more spontaneous or keep them in each corner? I probably won't get back to this till Saturday so let me know what you think. Watermelon Pink and Green - has me thirsting for a bite of watermelon! After making 16-patches from an assortment of 1-1/2" strips, I decided they would make nice centers for Ohio Stars. The centers finish at 4" which made it perfect for me to use assorted 2-1/2" strips as star points. Because I had a limited amount of the star background I had to stop at 16 blocks. The fact I had only made 17 centers was also a determining factor! I finished all 16 blocks today with only one Frankenstar. Tomorrow I'll finish up the sashing and contemplate my navel, uh I mean my border options. I have a crazy idea floating in my head to use some triangles I ended up not using in the stars. Stay tuned. A relatively new quilter, Michelle takes a well organized approach to the creative process. First she showed several of her own quilts and described the inspiration -- from traffic signs to indigenous art to architecture -- and how she loosely interprets what she sees. Sometimes it is obvious, other times not so much. During the workshop she led the group through a series of quick design exercises to get our creative juices flowing. In one exercise we had to work from photos that we had brought for both color and design inspiration. After my recent Frank Lloyd Wright pilgrimage, I have been wanting to translate some of his decorative art into a quilt. 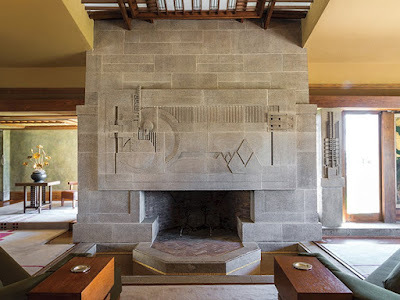 Specifically, I want to use the fireplace frieze in the Hollyhock House (Los Angeles) as the basis for a quilt. The most difficult thing for me is the ability to divorce myself from a literal interpretation of what I see. I just need more practice. Michelle wrapped up the day talking about construction, getting an original design from paper to fabric by breaking it down into sewable components. What a great way to spend a steamy hot Saturday! When Angela announced the color for July -- watermelon pink -- I couldn't find many scraps. Which seemed odd because that has been a favorite color of mine to work with in the past. I had too many things on my agenda early in the month, including 9 days on the road, to dig too deep. But once I returned home I looked in my scrap organization system (I use that term loosely) and found a pile of 1-1/2" strips and a few 2-1/2" strips. With just a week left in the month, I thought I should move some of those scraps out. My first thought was to make some string blocks. But since the scraps were cut to a uniform size, it seemed foolish to use them as strings. So I set about stitching two strips together, then foursies. Subcut those stripsets into 1-1/2" chunks and before I knew it I had about 20 of these cute 16-patches made. As an added bonus, several of the prints include bits of the accent color, lime green. I also included some blacks and whites with hot pink. My plan is to use these as centers for Ohio stars in a 12" block. A 4 x 5 setting will give me a 48 x 60 center. With borders it will make a nice lap size quilt. Does it qualify if you are making a "scrappy" quilt but the "scraps" have been cut from yardage or fat quarters? I'm inclined to say "yes." So here's my entry for Scrap Happy Saturday. Inspired by seeing completed examples of Cynthia Brunz' pattern Geese Migration, I pulled out the one I started earlier in the year. I am trying to have no more than two blocks with the same color sky. With a planned 32 blocks, that's a lot of "scrap." ... and used the design wall to start laying out the squares where needed. My goal is to assemble at least two blocks each day so that I can lay out the quilt on a large design wall at retreat in August. Of course, I have generated a lot more "scrap" in this process. I am making some HSTs as leaders/enders but I will have piles of 2-1/2" squares left over. Any ideas? The geese are flying again! Regular readers may remember that I began working on Geese Migration (a Cynthia Brunz design) earlier in the year. I got quite a bit accomplished at a retreat in February but was running low on variety in the 15 little squares per block so I kitted up what I had and set it aside till I could add to my stash of Japanese taupe-like fabrics at AQS-Paducah. Fast-forward to last Saturday. Two people at the St. Louis MQG showed their versions of the quilt and I was inspired to dig mine out when I got home on Sunday. However, the 25 (or more) FQs that I bought in Paducah and immediately washed/ironed/folded were still in a sack on the floor that I have been tripping over since the end of April. Desperate to figure out where I stood, I paired up kits and blocks with matching sky in the geese block (didn't want more than 2 of each color). Then I unfolded and cut a 2-1/2" strip from each new FQ. From there I cut 2 geese (Companion Angle), 2 right triangles (Easy Angle - for future use) and 4 squares. I'm planning to make my quilt a little longer than the pattern so I needed a few more blocks. And I wanted extras so that I will have some flexibility in layout when I get to that point. I know this is far from my One Monthly Goal (OMG), but I desperately needed to get that sack out of my way and get this project to a point that I can pick it up and work on it when I have time. There will be another retreat in August and I should be able to get the flimsy all together then. Of all stupid things we could have forgotten to do, we didn't update Gabby the Garmin before we left home. If we had, we might have noticed that she is only programmed for the Eastern US! Apparently it's a memory capacity thing. Anyway, we were not able to plug in our St. Louis destination, either by street address, zip code, township, NADA. The important thing is we made it and we were ready for a new day this morning. Jan (The Colorful Fabriholic) met me at St. Louis Bread Company (a/k/a Panera) and we made our way to the fabulous community center where the St. Louis MQG meets. Without going into details of the meeting, just be assured a great time was had by all! They even laughed at my jokes during show-n-tell! After lunch with some of Jan's bee friends, we managed to hit THREE quilt shops. Jackman's is big -- too big to whip through in a short period of time but I did manage to pick up four FQs in addition to the requisite RBR license plates while joking around with the staff. The Quilted Fox was on the second floor of a distinguished looking French Provincial office building. They had a very nice selection of many styles, including Australian and African. I focused my attention on some low-volume prints. Last stop was Janie Lou. A relatively new shop (not in my travel guide) and definitely leaning toward the modern side. I picked up a cute arrow background, a chevron dot, and a flesh Architextures to go with a recent purchase. Dinner tonight with Jan and her husband at a casual restaurant with Southwest cuisine. PS: Alex completed his FLW pilgrimage alone today at the Kraus House. I would be sorry I missed it had I not had such a great day! The first FLW homes we saw were Usonian (ranch style today) in the 1200 SF range. Next was Kentuck Knob, an "expanded" Usonian design of about 1600 SF. The 2-story Wescott House on Wednesday was 4,400 SF and the expansive Bradley House on Thursday was in the 6,000 SF range. Today we visited the impressive Dana-Thomas House in Springfield, IL, a generous 12,000 SF! It occupies a half city block. Twenty-four years later (and after two more husbands), impoverished and in poor health, Susan moved from the house and it remained mostly vacant (except for some occasional entertaining) for the next 20 years. Charles C. Thomas bought the house and most of its contents in 1944 to use as administrative offices for his publishing company. In 1981 the house was acquired by the State of Illinois and completely renovated. So the house has only had three owners in its 100-year history and most of the original furnishings have remained with the house. Unlike most of Wright's residential designs where the entry was hidden, Mrs. Dana requested a dramatic streetside entrance to make it easy for her guests to step out of their carriages and into the house. There are over 300 of these molded plaster blocks that have been painted to match the weathered copper gutters. Wright designed all of the decorative elements including art glass windows, furniture, and even flower pots. The art glass windows and skylights in this house are absolutely over the top! As is typical, no interior photography was allowed so our guide politely turned away while I photographed this Oriental carpet that reminded me of a sampler quilt. We requested the "specialty" tour that focused on Wright design concepts -- just the two of us and the guide for 2.5 hours. Oh so special! AND tours at the Dana-Thomas house are FREE (though they do "suggest" an appropriate donation). Definitely worth a visit if you are ever in the Springfield, IL area. The quilt shop stop today was Sew Unique on the north side of Springfield. It is a very small shop with a very limited selection of fabric. This being her first year participating in RBR, she had already sold out of her initial order of license plates. But I was able to order two to be mailed when the next order arrives. Tomorrow I meet up with Jan, The Colorful Fabriholic, to attend the St. Louis MQG meeting. Hoping to find time to visit a local shop, as well. Alex needed to print/sign (in blue)/scan/submit some business documents early this morning, so he located a FedEx Store just 3 miles from a quilt shop north of Kankakee. So thoughtful of him! In addition to the R-B-R license plate, I was still searching for the exact Moda Grunge I need to finish a project. I was successful at Top Shelf Quilts in Frankfort, IL! I also found a beige batik that may work in my String Bean quilt, and a purple that is a potential border candidate for Tropical Trellis. Up to this point I had been very focused on "need-only" purchases. Then I turned around and saw the Kaufman tree panel (designed by Avery Tillmon) and how it was bordered with a complimentary tree fabric and blue sky fabrics .... need I say more? Top Shelf is a lovely little shop in an out-of-the-way suburb of Chicago. The selection was limited, but excellent, and the staff went WAY above and beyond in helping me spend more cash! The FLW house tour of the day was the Bradley House in Kankakee. It is believed this house (and its next door neighbor) are the first Prairie Style homes designed by Frank Lloyd Wright over 100 years ago. This home was originally built for another wealthy industrialist but went through a succession of owners through the years, including a couple of property trades -- for many years it was a bird sanctuary, for a time it was offices for lawyers and an architect, and for over 30 years it was the very upscale Yesteryear Restaurant and Inn. Like many Wright homes, this one was purchased and restored by a foundation that now offers tours and special events. Again, an excellent tour led by a well-informed guide. We're in Springfield, IL tonight. The Dana-Thomas house is on the agenda tomorrow. I've seen it twice before and never get tired of it. I've also picked out a quilt shop (or two) to hit before we get to St. Louis tomorrow night. Since our house tour was scheduled for 11 a.m., we were able to make a quick circuit by Creative Fires in Springfield, OH. It's not a huge shop, but it has a nice variety and a huge collection of flannels. The owner is very cordial and helpful, definitely worth a stop if you're ever in the Springfield, OH area. In addition to the R-B-R license plate, I picked up a yard of a nice grey/white low volume dot, a couple yards of a teal diagonal stripe I might use in a border for Tropical Trellis, and a pink/yellow print as potential setting triangles for Terriffic Triangles (Marlene or Ramona suggested a pink/yellow stripe). If it doesn't work, I know I'll love it somewhere. Our Frank Lloyd Wright tour was at the Wescott House in Springfield. At 4400 SF, this house is definitely NOT in the Usonian class! It's hard to believe this very modern house was built almost 100 years ago. The tour was absolutely the best we've ever had; the guide was so well-informed, not only on the house itself, but also provided insight into the life and times of the family that built it. Mr. Wescott was one of several wealthy industrialists who built homes on "Millionaire's Row" in Springfield; he was even mayor for a term. Sad to say he ended up penniless in the 1950s. The house was purchased and converted into apartments after he died. When it was purchased by the foundation in 2001, it was in near ruins. It took five years to bring it back to something near its original condition. With a 4+ hour drive ahead of us, we headed west across the prairie -- very flat prairie. After a brief delay due to a driving rainstorm, we arrived in Kankakee, IL. We had forgotten that we are back in the Central time zone, so the delay was mitigated. Another quilt shop is on the schedule for the morning, another tour, and then we move on to SW Illinois. Stay tuned. I was so terrified of fireworks as a small child. My mother blamed it on the fact she was standing next to the man shot out of a canon when I was 9 months old. As an adult, though, fireworks make me smile -- as long as they are done professionally and safely. Well, the fireworks at Stonewall Resort on July 3 (Day 2) were fabulous! (for a small show) What made them fabulous for me was I could watch from our room in my jammies! Unfortunately I forgot I have a "fireworks" setting on my camera so the pictures through my window leave a lot to be desired. On Day 3 we drove up to Pennsylvania for the day to tour 2 houses designed by Frank Lloyd Wright and 2 designed by one of his pupils. All of the houses we saw were of the Usonian style -- designed for "common folk" who couldn't afford a custom design. The Duncan House is one of a very few of Wright's prefabricated homes built in Wisconsin, advertised to cost only $15,000 in 1957 (it ended up costing about twice that!). Destined for the wrecking ball, it was purchased, dismantled, and reconstructed on this site in this century. Polymath consists of 3 Usonian homes; all can be rented for overnight accommodations. After lunch at the Treetops Restaurant on site, we drove about 30 miles south to Kentuck Knob. We had visited this house two years ago, but this time we took the "in-depth" tour where we got to see three spaces not on the regular tour. Since our new house design is following Wright's principles, Alex was anxious to revisit some of the design features. We were not disappointed. Because the house is privately owned, photography was not allowed inside and it was pouring outside. You'll just have to take my word. We made it back to Stonewall just ahead of a tornado warning. Fortunately nothing serious developed. Being Monday and a holiday, no quilt shops in the area were open. We had all of Day 4 to get to our next destination, Springfield, Ohio. We made a stop at the Nelsonville Quilt Company, a sweet shop in Nelsonville, Ohio. The town of Nelsonville is the original home of the Star Brick Company. Hence the shop's license plate for R-B-R 2016. Another quilt shop and another house tour on the agenda for Day 5. Stay tuned!